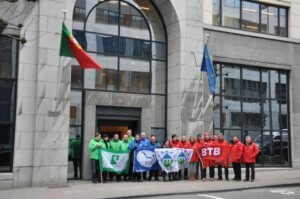 In the context of the solidarity campaign called by the ETF (European Transport Workers’ Federation) and IDC (International Dockworkers’ Council) to support dockers in Lisbon, ETF affiliates have been arranging meetings with and sending protest letters to Portuguese embassies in Belgium, Denmark, Estonia, France, Germany, Greece, Latvia, The Netherlands, Romania, Spain and the UK. Affiliates from other countries have scheduled similar events. Today, Tuesday 28 January 2014, a delegation of Belgian ETF affiliates and ETF Political Secretary Livia Spera met with the Portuguese ambassador in Brussels to discuss the most urgent demands of the workers’ unions. The Portuguese government has adopted a new port law on 1 February 2013, which raises grave concerns with European dockworkers’ unions affiliated to the ETF and the IDC. The reform of the Dock Labour Code initiates the liberalisation of dock labour and progressively deteriorates the labour conditions at the Portuguese ports, in particular at the port of Lisbon where 47 dockworkers have been dismissed with no rightful motives. Moreover, the law is in breach of the principles expressed by the ILO Convention 137 on Dock Work, which has been ratified by Portugal. Negotiations between the social partners aiming to reach a comprehensive collective bargaining agreement have been deliberately frozen by the employers’ associations and a new labour pool has been created to employ alternative low-income non-union workforce. The European dockworkers now increase the pressure on the Portuguese Government via their ambassadors to promote a meaningful dialogue between the unions and the port employers and to put an end to all the union-busting tactics. Both ETF and IDC have reaffirmed their commitment to continue joining forces and to defend the legitimate struggles of dockworkers in Portugal and throughout Europe. Additional information on the Portuguese dockworkers’ struggle is available here. You can read the press release issued with regards to the Portuguese port workers’ situation here. You can download the ETF-IDC statement on the issue here. Pictures from the actions taken by ETF affiliates in the different countries are available here.